Cowabunga and Happy Saint Valentine’s Day Eve! Hope you all come out of your shells this Valentine’s Day. Eh? Get it? Shells? Like a turtle’s shell? Eh? Eh? No? Okay. Original sketch in blue pencil, colors in Photoshop (using the same method that I colored Nina MC with). 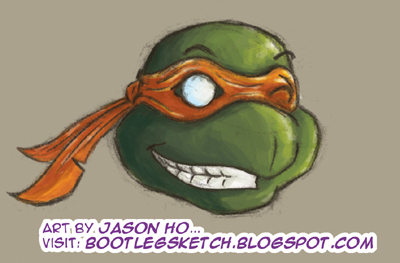 When I draw Ninja Turtles, I try and give them just a bit of a beak, so they’re a bit more “realistically” anthropomorphic. And that’s all I have to say about that! Come back on Friday for a more involved sketch (not involoving Ninja Turtles) accompanied by a long rambling post–the kind that you have grown to expect from me. < Previous "Uno Gato Muy Peligroso" o "Uno Blog Post Muy Nerdoso"
I really like this one! It looks like it was done in charcoals or similar. The shading is softer, less stylized (say like illustration or animation) and completely appeals to me. Here’s an idea: draw the Turtles a la Da Vinci (life drawings of TMNT!). I’d really dig that. Have u ever tried pastels or charcoals? Charcoals are my fave for life drawing. And simple pen. Now get the shell outta here! p.s. : This weekend, I killed a guy with a trident. nice.. its the mona lisa of TMNT illos. looks good , Jason. Now how about some action shots! lordshen: yeah.. you should probably lay low for a while… i love oil pastels… not as fond of normal pastels, but i like those too. i enjoy charcoals too, but don’t have much experience with them. anonymous: wow, that’s quite a compliment–thanks! josh: he’s winking! that’s an action!